FIRST® POWER UP, the 2018 FIRST® Robotics Competition game, includes two alliances of video game characters and their human operators who are trapped in an arcade game. Both alliances are working to defeat the boss in order to escape! Control the Switches and the Scale. Robots collect Power Cubes and place them on Plates to control Switches or the Scale. When the Scale or their Switch is tipped in their favor, it is considered owned by that Alliance. Alliances work to have Ownership for as much time as possible. Earn Power Ups. 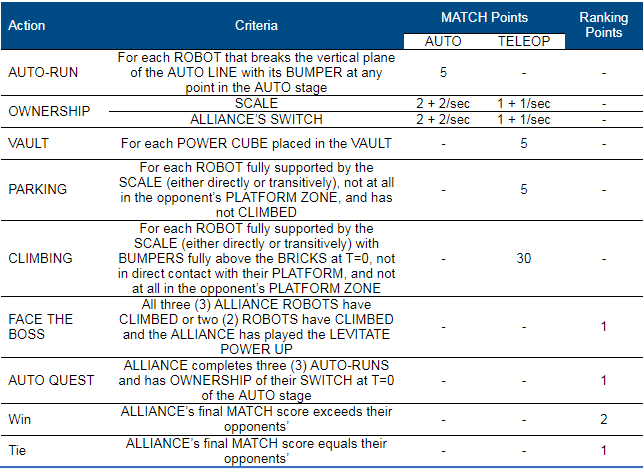 Robots deliver Power Cubes to their humans who then place them into the Vault earning the Alliance Power Ups. Alliances use Power Ups to gain a temporary advantage during the Match. There are three Power Ups available to teams: Force, Boost, and Levitate. Force gives the alliance ownership of the Switch, Scale, or both for a limited period of time. Boost doubles the rate points are earned for a limited period of time. Levitate gives a robot a free climb. Climb the Scale. Robots Climb the Scale in order to be ready to Face The Boss.